The springtime brings longer days, warmer temperatures and strong, gusty wind. High winds alone can cause severe roof damage. Add in heavy rains or hail, and you have a destructive combination. 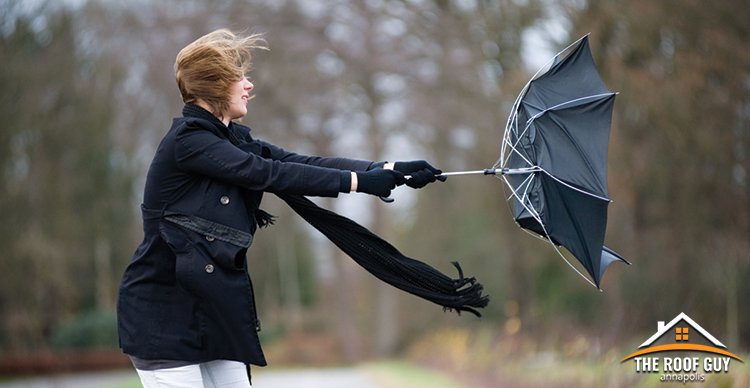 What exactly is wind damage? How do you know if your roof has sustained damage? What sort of issues could result from wind roof damage? Find the answers to these and more questions, and what you can do about it. Here in the Chesapeake region, we are no strangers to high sustained and gusty winds. These conditions do not hit across your roof evenly. 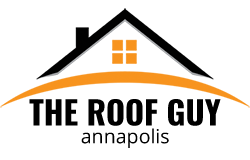 Therefore, exposing the corners, edges, and ridgeline of your roof to possible damage. For example, wind can get under a corner or a small piece of a shingle and curl or lift it. This leaves your roof unprotected, hence susceptible to leaks. Yet another cause for concern is “roof lifting.” While the roof may look intact from the ground, roof lifting occurs if the wind blows under an entire section. Over time, it loosens the nails thus causing a whole area to lift during windy conditions. Add rain into that weather mix, and there is the potential for the addition of water damage. What Are Some Other Roofing Issues Caused By Wind? High winds can blow debris around your property thus causing trees and limbs to fall on your roof. These falling limbs can puncture your roof and destroy shingles. Flying debris can be more damaging to your roof than the wind itself! Therefore, it is imperative that you maintain the trees on your property. That means ensuring no branches are hanging over or touching your roof. Also, assessing all trees every season, looking for dead or dangling limbs. Should the forecast call for high winds make sure you secure patio furniture or other decorative lawn and yard items. What Are the Signs of Wind Roof Damage? Leaks—Water stains on your ceiling mean water is coming into your house where it shouldn’t. Most likely, your roof is damaged and leaking. Do not delay! Contact a roof expert immediately. That way, you prevent further issue and serious problems. It is a good idea to check your attic periodically, especially after a massive storm. Missing Shingles—Strong wind gusts and heavy rains, especially following a brutal winter, could physically pull shingles from your roof. Contact a professional about roof repairs ASAP and prevent roof leaks. Curling Shingles—Look around at the stress areas of your roof, i.e. the edges, the ridges, near chimneys, for curled up shingles. Once curled these shingles will no longer prevent water from permeating your roof. Gutters—High winds and heavy rains can damage your gutters. Should this occur, your roof’s drainage system will suffer and could cause roof issues. Walk your home’s perimeter and make sure the gutters and downspouts do not have any significant dents or tears. Chimney Flashing—As we mentioned before stress points, such as the area around your chimney can be a common area to sustain wind damage. Always keep a close eye on this portion of your roof. Should you suspect that your roof has sustained wind damage, contact The Roof Guy. Our team of roofing specialists have years of experience and understand the mechanics of a roof. Don’t let a little damage turn into a huge problem. Call for your free inspection today!